Beebe’s model of eight functions and archetypes helps in understanding Te/Fe conflict. Te dominants and Fe dominants can activate each other’s demonic archetypes. The Te vs. Fe demonic battle requires awareness and attention to avoid relationship casualties. The Fe Demon may expect an emotional connection or support from the Fe Hero in the eye of the storm, but in a moment of perceived team crisis, the Te Daemon may reject individual requests for consideration in order to fulfill what appears to be a larger mission. With ENFJ preferences, I have experienced the power of Te, my eighth function according to Beebe’s model, as both Demon and as Daemon, as destroyer and creator. Te as Daemon can bring striking clarity and order in times of confusion and crisis, cutting through chaos with laser-like precision. It can look the monster of crisis in the eye and stare it down into submission as the wholeness of the functions working together fulfill what seems to be a great mission. But as Demon, it can roar through an employee’s routine performance improvement or termination meeting like a runaway train, leaving no one standing in its path; the employee lies crumpled in a ball wondering what hit him and if he ever really knew his attacker at all. In the throes of the demonic Te, harmony at all costs can find the price for which it can be sold on a sales rack. In the business world I have the privilege and challenge of leading a group of people where my two top lieutenants and direct reports possess ESTJ preferences. Their eighth function (Fe) is my dominant function. Though our typology is diverse, we have certain similarities in background and experience; we are women with similar educational and professional backgrounds and under normal circumstances, we complement each other. They employ carefully honed procedures and guidelines to lead their respective teams to success. From time to time I drag all of them outside into the fresh air and sunshine to watch ideas fly free and allow the teams they lead to play together. Unfortunately, there are times when we need each other most, yet end up letting each other down as the stress ignites the respective shadow functions within each of us. It seems that when I “finally see things their way” and am ready to launch into the formulation of a strategic game plan that I am certain they can help conceive and deliver, they react in strange and extreme ways that defy logic, rationality and objectivity and deny me my hopeful expectation of capable assistance in navigating choppy waves of crisis. Earlier this year I approached Lieutenant Number One with the proposition of redefining her role within the team to include more sales-related activities. There was no hidden agenda or mixed message as I approached the new venture with warmth and sincerity. Our business has lost a substantial amount of revenue due to market conditions and we simply need more activities related to sales, all of which she is more than capable of handling as she has successfully handled such activities in the past. But the mere mention of moving outside of her current scope of responsibility caused her to emotionally wilt and meltdown. I can only imagine that it was the combination of being confronted with the true scope of our crisis and the apparent shock of seeing herself, or perhaps not being able to see herself, in an undefined, emerging role that sent her into emotional panic. The emotional breakdown swelled far beyond the proportion of the request. The emotional storm raged on-and-off for hours and battered wildly against the wall of my dominant Fe and I also believe that my Fi Opposing Personality joined in the fray as the Fe Hero fell into the shadows. Thus in time my dominant Fe and oppositional Fi began to wage war with each other. At first I sought to comfort her. But over the course of several hours I began to resent what I saw as her emotional indulgence at a time when I needed a clear, logical approach to a serious situation that threatened the team. I matched her emotional tsunami with an ice storm that glazed the entire landscape. She could not keep her footing on the slippery fact, figure and forecast model path even as she looked cautiously above her head for icicle chards that could lop off her ear. Meanwhile, I floated off on an iceberg alone into darkness. In that icy battle I experienced more than a dose of disharmony. The conflict between Fe and Fi and my demonic use of facts, figures and forecasting models to eviscerate someone that I could not charm into submission led to isolation and hopelessness. It actually took quite some time for any true depth of emotion to catch up with the emptiness. In order to achieve reconciliation of the relationship, I called upon Lieutenant Number Two to mediate. Lieutenant Number Two successfully mediated the conflict without delving into typology concerns and I considered new ways to approach similar situations in the future. The decision to consider better ways to approach such challenges turned out to be timely because it wasn’t long after that successful mediation that Lieutenant Number Two and I became similarly pitted against each other in a series of smaller, but potent Fe vs. Te battles. The battles likely were smaller because I focused on slowing down the destructive process before it escalated to exile on an iceberg. The first battle with Lieutenant Number Two occurred under very similar circumstances as the battle with Lieutenant Number One. I asked her to add a sales-related step to one of her procedures to assist the team. After an angry, obscenity-laden oral blast over the suggestion of such a modification to her procedures, she wrote an email treatise to me on why she needed to continue to operate exactly as she had been operating sans sales activities. My only response to this situation was to withdraw my request which may have emboldened her; two more conflicts loomed on the horizon. My external response to each of the next two situations was calm and considerate, but indifferent to her emotion. My external response stood in stark contrast to my internal response. Internally, I experienced the same series of responses as with the first major battle with Lieutenant Number One. First, I had an urge to comfort her, but something inside caused me to suppress the comfort because it seemed illogical and inappropriate based on the circumstances. No one died. No one was starving, sick, homeless or injured. I wondered what she would do if a catastrophe were to occur and I left her in charge. This triggered resentment because I felt that I could not rely on her to respond appropriately in this difficult time, but I suppressed any sign of resentment. One of the situations arose out of bad news she had to deliver to me. I listened, responded supportively, but never stopped eating my lunch. In a rare and bare existential sensory moment, I became hyper-aware of every motion of hand to food, then hand to mouth as she rambled tearfully and hysterically about the unfair and ridiculous nature of the potential dispute. I felt absolutely nothing. I have subsequently had conversations with Lieutenant Number Two regarding her emotions and the toll it takes on her personally as well as the team. I have had long discussions with her about situational stress and the need for the team to have faith that its leaders can calmly wade through shark-infested waters. I have not successfully persuaded her to assess and evaluate her emotional experiences to better understand them, and we seem to continue to drift apart. I console myself with reminders like “leadership is a lonely place” which at once trivializes and exacerbates the situation. The Te vs. Fe demonic battle requires awareness, exploration and attention to avoid relationship casualties. The Fe Demon may expect an emotional connection or support from the other’s Fe Hero in the eye of the storm, but cannot rely upon it if the Te Demon has become emotionally detached. Furthermore, in a moment of perceived team crisis, the Te Daemon may reject individual requests for consideration in order to fulfill what appears to be a larger mission. Accordingly, in the scenarios described herein, the ESTJs may have expected the ENFJ to respond in crisis with warmth and sensitivity as she has responded in the usual tasks and challenges of everyday life. But the stress of crisis became a game changer; the shift occurred at the critical fifth function, Fi, to take all of them on a journey into foreign territory. The ESTJs may have expected an emotional oasis but ended up abandoned on a cold island just far enough away from the ENFJ’s own island to make it difficult to connect on either a rational or emotional basis. I will be working through some exercises with my ESTJ sisters to bridge the chasm and hope to share those with you once they have been tested. 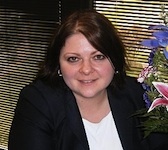 Laura Simon manages human resource and business operations for an insurance intermediary. Previously, as Director of Leadership Development for the company, she designed a program to effectively rank the company’s leaders and assisted in the launch of an in-house leadership development school. Laura earned her MBA degree from the University of Tampa with a concentration in Management and her law degree from Cleveland-Marshall College of Law. She is certified to administer the Myers-Briggs Type Indicator® as well as other assessments.